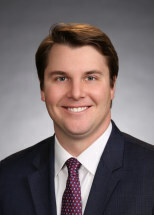 Michael Christensen is a senior associate in the firm’s Litigation Section. Michael’s practice focuses on energy and real property litigation, commercial litigation, including contractual disputes of any nature, and personal injury defense. Michael is a Midland native and has represented the interests of Fortune 500 companies, publicly traded independent oil and gas companies, and privately held companies of all sizes throughout the Permian Basin. Michael earned his undergraduate degree from Texas Christian University and graduated from the Texas Tech University School of Law. Michael is licensed in Texas and New Mexico.